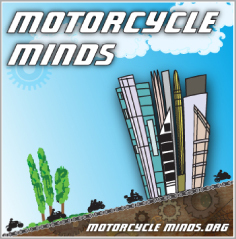 In January 2010 we first reported discussions that were afoot which could change the world of motorcycling as we know it. We are publishing information as we become aware of the latest agreements made by Council, Parliament and the Commission regarding the EU regulation proposal. We have been very fortunate to have access to these documents and rather than leave riders to speculate, we prefer to provide the information as it arrives on our desks, so that people can make up their own minds. 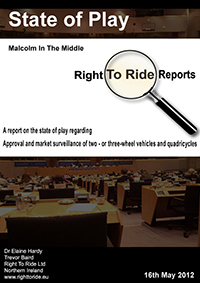 To the publication in October 2010 of the Commissions proposal – Approval and market surveillance of two – or three-wheel vehicles and quadricycles and the commissions proposal now been discussed within the Committee on the Internal Market and Consumer Protection (IMCO). The process is now moving through Parliamentary Procedures which included a “high level” meeting in Brussels on the 15th May between the European Parliament’s negotiating team led by Chairman of the IMCO Committee Malcolm Harbour (MEP), the Danish Presidency of the EU Council of Member State Governments, and the European Commission, to thrash out the various positions and amendments to the proposed regulation “Approval and Market Surveillance of 2 or 3 wheeled Vehicles and Quadricycles but also world standards in terms of emissions, durability, safety and vehicle specifications. During prior discussions at technical meetings, it has already become clear that the Parliament’s proposal for an Article 18a is unlikely to survive the negotiations because this does not fall within the scope of the regulation and has since been removed. 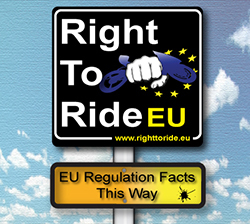 We have had access to a briefing note from the 1st June 2012 and information from a trialogue meeting on the 19th June, both of which are in the public domain. European Parliament – 1st Reading – is now forecast for 25th October 2012 – discussions between Parliament – Council and Commission are on-going. Our position aims to protect the spirit and historic tradition of modifying motorcycles. 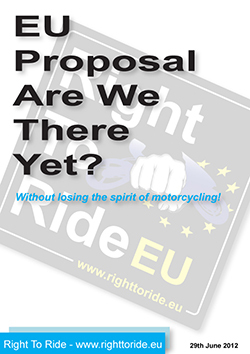 These proposals are for new motorcycles manufactured after a certain date – there are no proposals at present for these regulations to be imposed retrospectively – to motorcycles already manufactured – thus what we fighting for is the future of motorcycling! 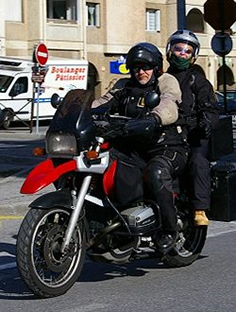 12th July next (and probably final) meeting of the Council to discuss the Proposal for a Regulation (EU) of the European Parliament and of the Council on the approval and market surveillance of two- or three-wheel vehicles and quadricycles.